Carl boxing in a gym. 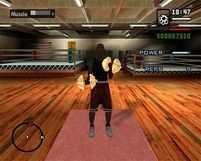 A gym is a facility in Grand Theft Auto: San Andreas where the player can train to improve his/her physical stats. 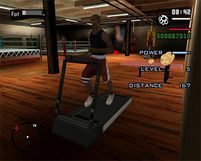 Indoor gymnasiums are unlocked after receiving a phone call from Sweet after the mission Drive-Thru, introducing the player to gymnasiums. All gyms are open all day, every day. 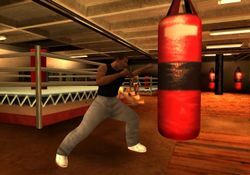 If, in a single day, the player loses 40% fat or gain 20% Stamina or Muscle, the player will have to wait 12 hours before being allowed to workout again. The Below the Belt Gym in Redsands East, Las Venturas. 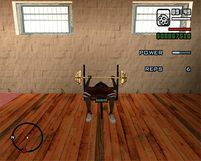 A private gym inside Madd Dogg's Crib in Mulholland, Los Santos, unlocked after "A Home in the Hills". Treadmill This exercise increases Stamina and sheds fat. The treadmill offers 10 speed levels (the higher the level, the faster your stats will change). Higher levels are easier with greater stamina. When CJ begins running, power and distance gauges, as well as a level indicator, appear on-screen. You must keep pace with the treadmill to keep the power gauge full - if it empties, you fall off. The stationary Bike offers 10 speed levels (the higher the level, the faster your stats will change). Higher levels are easier with greater stamina. 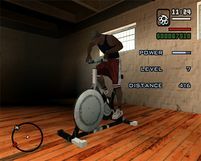 When CJ begins cycling, power and distance gauges, as well as a level indicator, appear on-screen. You must keep cycling to keep the power gauge full - if it empties, you'll have to start over. Bench press This exercise increases Muscle and sheds Fat. The weights range from 40 lbs to 320 lbs. When you begin, a power gauge and a reps indicator appear on-screen. You must get the power gauge to fill to complete one rep.
Dumbbells This exercise increases Muscle and sheds Fat. The weights range from 20 lbs to 110 lbs. When you begin, a power gauge and a reps indicator appear on-screen. You must get the power gauge to fill to complete one rep.
Each gym has a trainer with a different fighting style, but the player will only have access to them when the player has amassed enough muscles. At each, walk into the marker and reply positively when the trainer asks if you want to learn some new moves. The training takes a tutorial-type approach, with tips on-screen to tell you how to execute the moves and when. You must defeat the trainer to learn the new moves. Each teaches you a new Running Attack, Ground Attack, and Combo Attack. The Ganton Gym features a Boxing trainer. The Cobra Marital Arts Gym features a Kung Fu trainer. The Below the Belt Gym features a Kick Boxing trainer. If the player forfeits a sparring match at any gym, they will lose all weapons they are carrying and will be unable to recover them. This is more likely to happen at the Cobra Marital Arts Gym, where the player simply has to step off the floor mat to end the match. There is a glitch that prevents you from using any equipment, citing that you have trained enough even if you haven't exercised at all after a lengthy period of time. The glitch occurs most commonly by saving at Madd Dogg's mansion, or the Mulholland safehouse but can be triggered by rare events, too. The main cause is saving the game while equipment are nearby. The glitch can also occur if you save your game on two different slots in a very short time. If viewed close-up using the zoom features of the camera or sniper rifle scope, players can see the logo of the Cherry Popper Ice Cream Factory on the side of any gym's dumbbells. Indeed, both the weights at the bench and the dumbbells derive their textures from those intended for wooden boxes. This page was last modified on 19 November 2012, at 17:48.